Microsoft's public bragging about its success with Netflix adoption among Xbox Live subscribers did not go unnoticed by the press release conjurers at Sony. Which is unfortunate, really. So how does Sony respond? In a media "highlight," one which gave us horrible flashbacks to this episode, Sony attempted to chip away at the Netflix service's strengths by touting free access to its PlayStation Video Store, faster download speeds, and newly released, terrible movies captured in stellar Blu-ray clarity like Max Payne and Swing Vote. Sure, there are some good points here: There's plenty of choice on both platforms. Yes, the reliability of the Netflix stream over Live can be shaky, but I couldn't speak to the PlayStation Video Store. I've yet to download or rent from it. And we'd agree — new bad movies on Blu-ray outclass the old bad movies available via Netflix and Xbox Live. But perhaps the approved list of how the "PlayStation 3 and PlayStation Network offer a comprehensive digital entertainment experience" will convince you. It's full of value-propositions! Free Access/No Double Fees: Users pay a separate monthly Netflix subscription on top of an annual service fee for Xbox LIVE to access Netflix content, PlayStation Network users have free access to the content they want. Video Content on the Go: One of the main value propositions of the PlayStation Network's video delivery service is the ability to transfer standard-definition content from the PS3 system to the PSP system. For one price, consumers can transfer and view certain types of content on multiple devices. Faster Download Speeds: In a recent experiment by MTV Multiplayer, PlayStation Network was found to be the fastest service for downloading games amongst current consoles, whether through wired or wireless connections. Quality HD Experiences: PlayStation Network provides HD content reliably without waiting for streaming connections that might not ever be made. Blu-Ray and Streaming: PlayStation 3's browser and Flash 9 support allows users to easily stream content and watch videos through internet sites on their TV's. 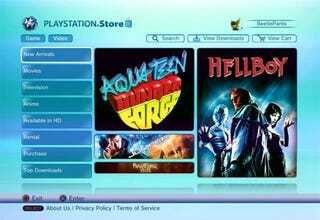 Users can also download HD blockbuster movies from the PlayStation Store or enjoy Blu-ray movies.